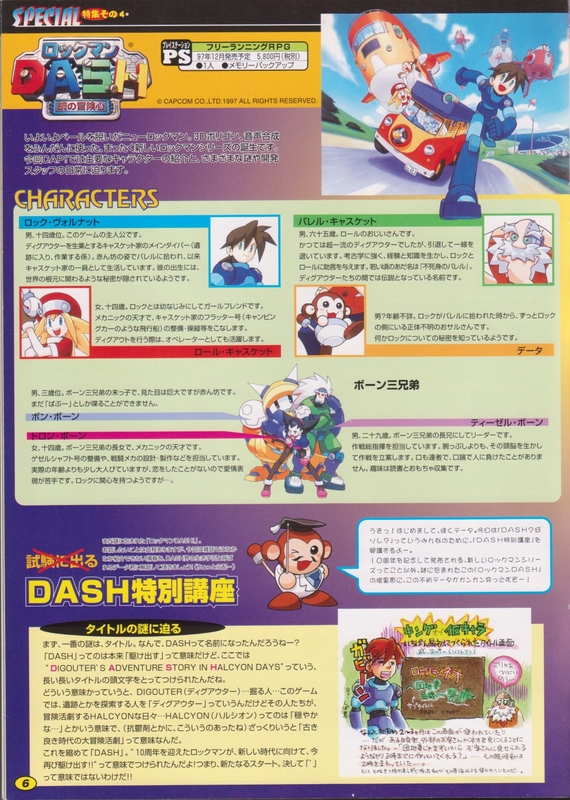 Back in the fall of 1997, the first 3D polygon-built Rockman game had finally settled on a name: Rockman DASH. The project had originally been dubbed Rockman NEO, but just like its spin-off predecessor Super Rockman had evolved into Rockman X, Capcom had never settled on the NEO title. Instead, they preferred to see where the course of development would take them before deciding on the perfect final name. Outside Japan, we watched the game change from Mega Man Neo, to Mega Man Nova, and then finally land on Mega Man Legends. Coming up with just the right name is no easy task. So what made the developers choose DASH? And what else were they calling it before then? After all, you have to call a game something while you’re working on it… In CAP! Vol. 5, Capcom decided to let all the news-hungry Rockman fans in on what was going on behind the scenes, and get everyone hyped and ready for its upcoming release that winter. At long last, the new Rockman has been unveiled! Using 3D polygon graphics and fully integrated voice overs, a brand new Rockman series is born. This time CAP! is bringing you the scoop on all the main characters, plus we get into the daily grind with the development team themselves as they answer everything else you need to know! Male, roughly 14 years of age. The protagonist of the game. As the main diver of the Caskett family, he earns his keep as a digouter (someone who makes a living by exploring the ancient ruins). Found by Barrel when he was just an infant, Rock was taken into the Caskett household and brought up as one of their own. 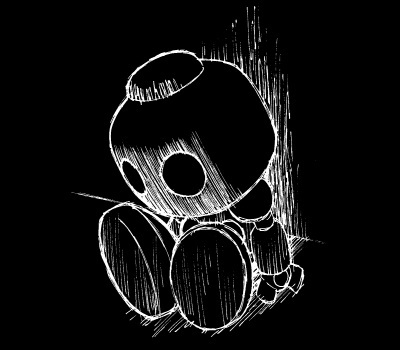 The mystery behind his birth holds a hidden secret that is linked to the very origins of their world. Female, age 14. Rock’s girlfriend who he’s known all his life. She’s a genius mechanic and in charge of both piloting and maintenance of the Flutter (the Caskett family’s flying RV). When Rock is on a digout, she acts as an operator for him. Male, age 65. Roll’s grandfather. Once a special first-class digouter, he is now retired. Well versed in archaeology, he shares his vast experience with Rock and Roll as their mentor. In his younger glory days, he was known as “Barrel the Immortal.” That name is still legendary today in digouter circles. Male? Age unknown. Ever since the time Rock was first found by Barrel, this mysterious monkey has been by Rock’s side. He may know something about Rock’s hidden past. Male, age 29. The eldest of the Three Bonne Brothers, he acts as the leader. The tactician and mastermind. He’s in charge of coming up with the group’s mission plans, which often favor strategy over brute strength. He’s also a gifted public speaker, and never one to lose an argument or debate. His hobbies include reading and toy collecting. Male, about 3 years old. The youngest child out of the Three Bonne Brothers, he may look enormous but he’s actually just a baby. He still doesn’t speak much other than baby talk like “Babuu”. There’ll be a test at the end! Uki! Nice to meet you, the name’s Data. Now for all of you out there scratching your heads and wondering “DASH? What’s that?” You’re in luck! Because today, I’ll be answering all your questions in my “DASH Special Lecture.” Let’s begin! We’ll start with the basics. Rockman DASH is a brand new Rockman series that’s coming out to commemorate the 10th anniversary of the franchise. There’s going to be a lot of questions arising and mysteries to get to the bottom of, so let’s jump right in and get cracking! First off, the number one question on everyone’s mind is the title itself. Why is this called “DASH” anyway? And there you have the meaning that’s packed into the title DASH. 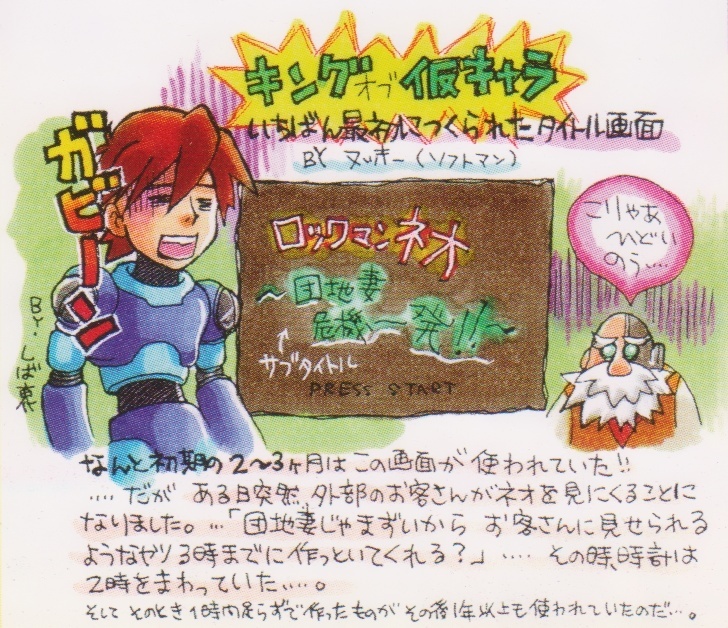 The producers also wanted to say to everyone “As we celebrate the tenth anniversary of Rockman, let us also DASH forward together into a new era!” In other words, this is like a fresh start for a familiar face. Whatever you do, don’t go confusing its meaning with that other Dash‘!! That other dash refers to Street Fighter II’, the series of sequels that were each a slightly revised version of the previous Street Fighter II game. Far from being an improved version of the old Rockman games, DASH here meant a whole new experience. Halcyon days is an expression that can refer to a time we looking back at with fond memories (and not so much about how things were in reality, either–it’s how it’s remembered that counts). Every gamer probably has their own version of the Halcyon days… That powerful nostalgia that each of us has towards the games we grew up with. While we each may see the “good ol’ days” of gaming differently based on our own experiences, I’m sure we can probably all identify with the feelings we have for the games that were our pivotal or most personal coming of age titles. When DASH was first released, the fans that had been the first to be hooked on Rockman had aged 10 years, becoming teens or even adults. So too had the gaming landscape changed over the decade. DASH sought to appeal to these grown up fans and also to reach out to new audiences. With action, adventure, humor, romance, and underneath it all a deep dark mystery to solve, it was meant to be the work that showed how Rockman had grown up along with the gaming community. The series Inafune called his clumsy son may have sputtered out after 3 years, but it also paved the way for the next ground-breaking Rockman title that was unarguably a hit, Rockman EXE, whose own tenth birthday we just celebrated. Now, another 10 years after its last major title release, DASH has enjoyed a resurgence. And this time, the nostalgia many gamers are feeling is actually for this series itself! Funny how things have come full circle after all that time. For the game that was once accused of being ahead of its time, has the age of DASH come at last? Enough musing. Before I forget, there’s still one important thing left on the page! Who was this landlady, and why was a run-in with her so noteworthy? Was she a companion, a damsel in distress–or a dangerous foe? Did Nukky owe his landlady money when he came up with that title? And who was this important visitor that set everything in motion? So many questions, so few answers. Speaking of questions, Professor Data’s not done with his lecture yet. There’s still another page to go, so come back next Monday for part 2 of this CFC special for a look at more concept art, and Data addresses queries like “what’s the deal with Digouters?” “Is Rock still a robot?” and “does the story connect to the previous Rockman series?” Some of his answers may surprise you! 4 Comments to "Developer’s Adventure Story in Halcyon days"
So… technically, it should be DASHD. Well at least we finally know why it’s named DASH. Though, was that ever actually explained in the Japanese manuals? 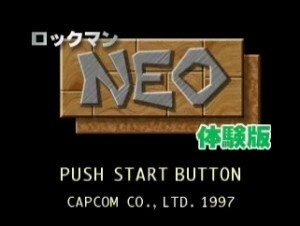 Or were Japanese fans who missed out on that magazine also scratching their heads as to the naming of the game? The “DIGOUTER’S ADVENTURE STORY…” line is right on the cover for the original release of the game. It wasn’t explained like it is here, so maybe a few wondered what Halcyon days meant. Kung Fu Hustle springs to mind.